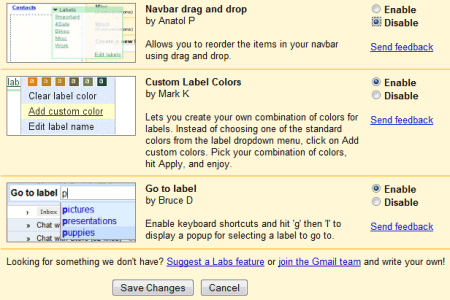 Gmail Labs added 3 new experiments that improve the way you manage labels. "Go to label" adds a keyboard shortcut for selecting a label. Gmail already has shortcuts for navigating to the inbox (g+i), drafts (g+d), starred messages (g+s), but you can now type g followed by l to get a box that lets you enter the name of a label. In most cases, you only need to type the first letters of the label and then press Enter. If you like the colors that can be associated with labels, but you find the number of options too limited, there's a new option to add custom colors by selecting colors for background and text. Probably the less useful experimental feature, "Navbar drag and drop" lets you reorder the boxes displayed by Google in the left sidebar: Gmail Chat, labels, Quick Links, Invite a friend. The three new features can be enabled in Gmail Labs, a section available in the new version of Gmail and only for English interfaces. I wish they'd come up with a way to add multiple labels via a filter. That'd be my favorite feature, as it's just annoying to have to create multiple filters to do the same task. My most-wanted feature on GMail is to be able to control my own ordering of labels. Alphabetical so does not cut it. Navbar drag & drop is the most useful for me... I can move my Quicklinks above my Labels. Yay! Labels with sub-labels will be a great help. But from these three, I like "Navbar Drag & Drop" the best. When is Gmail going to start the feature of recalling the sent messages. I agree with lantere that Labels with sub-labels will help us more. When Gmail Labs, will be avaliable in other languages.